A functional, economical chair for studio use. 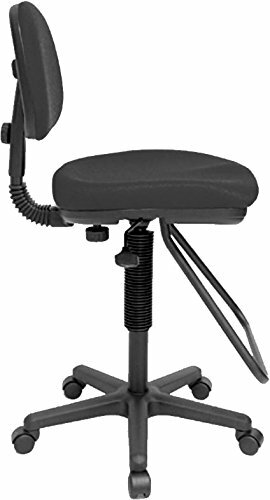 Features include pneumatic height control, polypropylene seat and back shells, a height- and depth-adjustable hinged backrest, built-in steel teardrop footrest, dual-wheel casters, and a 23 inches diameter reinforced nylon base. Molded foam seat cushion is 17 inches w x 16 inches d x 2 1/2 inches thick. Backrest is 16 inches w x 11 inches h. Height adjusts from 23 inches to 27 inches . Black.